In late January, 2017, Lil and I went to Shanghai for 6 months shortly after I retired following 39 years of teaching and research in neuroscience at UW-Madison. I had been offered a short-term teaching appointment in neuroscience at NYU-Shanghai and thought this would be a great way to ease into retirement. I had a fairly heavy teaching load (two undergraduate courses, one a non-majors course and the other for neuroscience majors) but there was no research and little administrative responsibilities so we had time for travel on weekends. In preparation for the trip, we first decided to decline the faculty housing offered by NYU-Shanghai, which was in the modern high rises of Pudong. Instead, we took the housing allowance and looked for a suitable place in the former French Concession. This was a good decision as the French Concession was a much more interesting place to live than Pudong. After spending a week or so investigating the many choices available on Airbnb, we settled on a place on Xiangyangnan Lu in the French Concession. After we finalized the reservation, I notified the other places that we were no longer interested and was surprised to get an email back from one of the hosts that she had heard that I had decided on another apartment. This was the first hint that this was not your usual Airbnb rental. NYU-Shanghai provided an apartment in their faculty housing for the first 10 days to help us get acclimated. It was clear that they were used to having new faculty come for short stays as the bureacracy was well organized. We were met at the airport with a limousine and our temporary apartment had a nice view of Pudong from the south. We arrived shortly before the Spring Festival as they call the Chinese New Year’s celebration so many shops were closed as most people go home to see their families during this period. Our first view of Pudong from our temporary hotel. Night view of Pudong from our temporary apartment. Two of the tall skyscrapers are visible to the left in the distance. Our temporary hotel was near a big super market, supposedly one of the bigger ones in the city. Think 99 Ranch and multiply by 2 or 3 for both produce and number of shoppers. We went the night before the new year’s break and it was utter chaos. We ended up standing in line for about 20 minutes to check out. People were pretty orderly and queued nicely. However, getting thru the too-narrow aisles with congestion was difficult. And then add in a constant, very loud marketing chatter about special sales going on and new year’s specials played at high decibels with a comedic rhythm made for a cringe-worthy experience. In general prices here are about half of the equivalent in the States. A dinner for four totaled about $120 with a bottle of wine and 7 or 8 fancy dishes. Our lunches for the two of us have averaged about $3 or so. Most of these have been at small diners where the food has been ok, but not great, but the variety is impressive. Not all places take our US credit cards. The smaller shops often did not take them but the larger ones did. That’s been true for both our Visa and Amex cards. Street food, on the other hand, is quite a bit cheaper than comparable street food in the US. In fact, for the popular shengjian guotie (生煎 鍋貼), the iconic Shanghai dumpling that is the fried version of the famous steamed xiaolongbao (小籠包), it’s about 1 yuan each whereas in Madison, the xiaolong bao is about $1 each, so you are paying about the same if you ignore the 7:1 exchange ratio! Shengjian guotie are like xiaolong bao in that they have a soup inside, but they are fried upside down so the pleated part of the guotie gets crispy. We were attracted by our Airbnb description of a dumpling shop right down the street from our place. Despite what Lil claims, this was not the deciding factor in choosing this Airbnb. This is a true ‘hole-in-the-wall’, a small room just big enough for the two brothers who run the place to make the dumplings and fry them out on the sidewalk. Everything is take-away with no place to sit down. And the ‘shengjian guotie’ are delicious! I often stop there on the way to work to pick up a few for breakfast and a few more for lunch. It comes in a small cardboard container, with a simple pair of chopsticks in a small plastic bag. They are about 1 yuan each ($0.15 US) so I get 6 for a dollar. Like the more famous xiaolongbao they have a soup inside them so you have to be cautious when biting into them. Unlike xiaolongbao they have a hard and crispy and chewy bottom. They make them in a big frying pan with a lid which holds about 80-100 I’d guess and they are often frying another batch while the previous batch gets sold. When I stop in the morning on my bike, there’s often a short line and sometimes it’s between batches so not available unless I am willing to wait the 7 minutes that it takes to cook them. I would eat there every day except they are a bit greasy and there’s no coffee. Supposedly they’ve been selling guotie at this place for over 30 years. We had the benefit of having a couple of relatives living in Shanghai who helped us get our feet on the ground. We spent the first couple days trying (and succeeding after much time and effort) to establish a bank account, get Lil a Sim card for her phone , figure out VPN (thanks to James for helping here! ), and getting oriented at NYU. NYU gave me an iPhone to use so I had to learn how to use and type on it. My favorite breakfast place - a hole in the wall dumpling store run by 2 brothers. The full pot of dumplings while frying. The sign says they sell shengjian guotie, the Shanghai specialty of fried soup dumplings. As is the case for all apartments in the older parts of the city, the entrance does not face the street but rather an alleyway that wound around the large interior of a city block. Our building was down a long winding alley and the exterior, especially our stairwell, looked a bit like a Brooklyn tenement house in the 1950s, i.e. pretty run down. But some of the apartments have a fancy doorway, like ours, which probably holds a nicely remodeled apartment inside. Our apartment, on the 4th floor, was very nice inside, though a bit crowded from our USA view. It has a small combination kitchen/dining room/living room and then two bedrooms, one of which is pretty substantial by Chinese standards and the other just has room for a double bed. The apartment, as advertised ‘in the sunshine’, faces south and gets a lot of sun and has a small balcony which is nice when the weather warms up a bit. One of the best things about our place is the neighborhood is very interesting. Within a half mile radius of our place one can find small shops that pretty much specialize in a single item: fresh mantou and bao tze, sheng jian (the Shanghai specialty guo tie, or pot sticker), tang yuan (the sticky rice flour balls filled with sweets – the black sesame tang yuan are the answer to Jerry’s complaint of the lack of a good Chinese dessert), several roast duck places, camel’s milk products(! ), you tiao (deep fried crullers usually eaten with soy milk) and shaobing (a baked pastry) which make up the iconic Chinese breakfast, several French patisseries, several coffee shops, and dozens of niu ro mein with hand pulled noodles of many varieties. And then there are the more traditional restaurants and cafes of many cuisines. 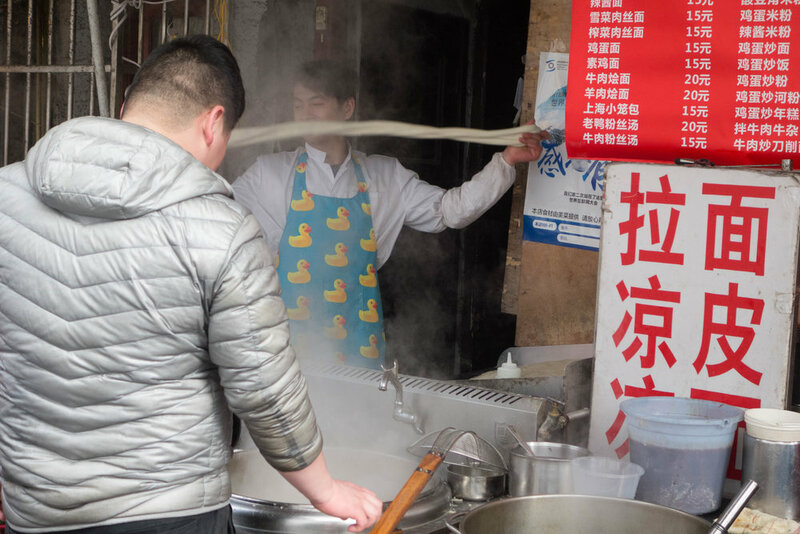 There seem to be an unusually large number of Muslim/Xinjiang related restaurants, and many of them are running the hand pulled noodle shops. I’ve especially enjoyed going to the breakfast specialty places. Some are tiny hole-in-the-wall, Mom and Pop shops making mantou and bao tze. Others are larger with a wide clientele so that if you go at the wrong time, you have to stand in a line that snakes around the block to get your youtiao and shaobing. Inside this place are 10-15 workers in a small room where they can barely turn around, each one doing one job in an assembly line to satisfy the hungry mobs. Or you can go to another place that has essentially the same menu but for a bit higher price and a nicer ambience. Unfortunately the youtiao is a bit greasy to eat every day. Lil made friends with the bao tze place just a few doors down the street and they save her the particular bao tze if they aren’t ready yet. Do you get the sense that we miss the food choices in Shanghai? Another specialty shop selling roast duck. It has attracted a long line for New Year’s and yes, it was delicious. A specialty store selling camel milk products! Closed for the new year. This store specializes in the rice dumplings (tangyuan 湯圓). A great Chinese dessert! The city itself is rather incredible especially compared to what it looked like in 1980 when we were last here. Now it looks like a different planet! The number of tall skyscrapers and modern buildings is very impressive and it is clear that the people have a very positive outlook to the future. On almost every big intersection there is a fancy shopping mall with high end stores and fancy restaurants. The entire city of Shanghai must have hundreds of these malls! Most people, especially the women, are dressed very fashionably with expensive clothing, bags, jewelry (though they may all be knock offs), so I am fitting in well. On the other hand, across the street is often a very poor old woman selling apples or collecting cardboard for a living. The contrasts are great. It’s not hard to imagine that China will be a more powerful economic force than the US in the near future. It’s like if the government decides to do something, they will just gather the means to do it. A common theme you see as you walk around the city is an attempt to revive the ‘old’ Shanghai of the 1930s. Many places advertise having ‘old flavors’ or old Shanghai tastes. The most famous of these rebuilt Shikumen is the area known as Tianzifang, which has become a trendy and lively art and crafts enclave always crowded with shoppers. This has become a model for other cities too. The best place to view the new Shanghai is on the Bund, the famous walkway along the Huangpu River that looks across at the high rises in Pudong. This is also a good place to people watch as the locals seem to like to congregate here. Commonly on weekends you see three generation families with the grandparents towing the kids. Now I understand why NYU offered me a free IPhone. It is virtually impossible to get along without one here. For the visitor of course the maps are very useful to get around and Google translate helps to navigate the language. By the way, while Google is banned, if you have VPN, you get around the ban almost seamlessly. But for things like banking the cell phone is essential. Almost all transactions involve the cell phone as an identity and security check. Almost all of our purchases were done with WeChat so that China has become almost cashless, at least in Shanghai. I signed up for both Mobike and Ofo, the bike sharing companies. The neat feature is that every bike has a GPS so you don’t have to return the bike to any particular place. Just leave it on the street. When you need one the app tells you where the nearest bike is. You go and scan the QR code with your cell phone and it unlocks the bike. When done, lock the bike and it charges you at the rate of 15 cents/half hour! We live about 15 minute walk from the subway so I can hop a bike for a few cents. Of course riding in the traffic is not to be taken lightly as there is a general disregard for traffic laws by the many many motorcycles and electric bikes that run the city. Everyone also uses WeChat, not only to communicate but also to pay bills, send money, etc. I had to pay the Airbnb landlord the VAT fapiao tax so the NYU HR person came down to my office with his bank account number. But since I had WeChat, I could just put money into WeChat from our bank account and then send it to him on WeChat. Took about 5 minutes! Most restaurants and stores take WeChat, or the other popular one AliPay, which Lil uses. Of course I’m probably showing my lack of cell phone usage in appreciating what it can do here. The subway system is also very impressive. Fast, and efficient, you rarely have to wait more than 3 minutes or so for a train. They are, however, very crowded, even off rush hour. Only about a quarter of the passengers can sit. The others have to stand. So the sociology of the subway is interesting. When the train arrives at a stop, the standing passengers race to take the empty seats of departing passengers who were seated. Meanwhile the passengers waiting to enter the train are also rushing in in hopes of getting an empty seat, which of course prevents the departing passengers from getting off the train. If two passengers are eyeing the same empty seat, there is usually a little ke-chi involved, so that men will defer to women. But actually small children seem to get the highest priority; they rarely have to stand. Someone will always offer them a seat. Personally, I’m old enough that about a third of the time, someone will offer me his/her seat. If I decline, they will scold me so I pretty much have to accept unless I’m getting off at the next stop. One interesting thing is that many more women offer me their seats than men, by about a 10:3 ratio (I’m gathering data for a sociological study). Virtually all of the jobs of positions that visitors deal with are taken by women. I would say 90% of the workers in banks are women, except for the top position. At NYU, the same proportion of jobs in the HR office, library, administration, etc. are women. IT support is about the only division with mostly men. Men of course are driving the taxis, working in the repair shops, but the middle class work looks to be dominated by women. One disappointment is that we have had little interaction with our neighbors. I had imagined we would see them outside and chat with them about whatever. In our previous trip to China in 1980 you almost had to fight off strangers who wanted to come talk to you (and ask for favors). Now it seems like foreigners are so common that they don’t attract interest. Of course, our neighbors are probably used to seeing a new set of strangers in our apartment every few days due to the Airbnb rentals. I’ve actually enjoyed conversing with most strangers, but they can be extremely rude or very warm. I don’t know if the rudeness is a reaction to our obvious non-native background. The street dialect is strongly Shanghainese, which I cannot understand at all. Panorama of the some of the skyscrapers in Pudong. Three of these are among the tallest buildings in the world and all were built after 2000. Taken from Century Ave. The three giants of Pudong. From left to right: Shanghai World Financial Center, Jin Mao Tower and Shanghai Tower. One of the popular attractions of old Shanghai is the Yu Yuan gardens and the surrounding shopping area. This is a classical Chinese garden occupying about 10 city blocks. We visited it a couple of times, once during the super crowded Lantern Festival and the other times when our kids visited. For a visitor there’s lots to see and do in Shanghai. One of the interesting things to do is to go to the parks. Like all big cities most people in Shanghai live in crowded neighborhoods and small apartments so the parks are a chance to get some fresh air and to socialize. 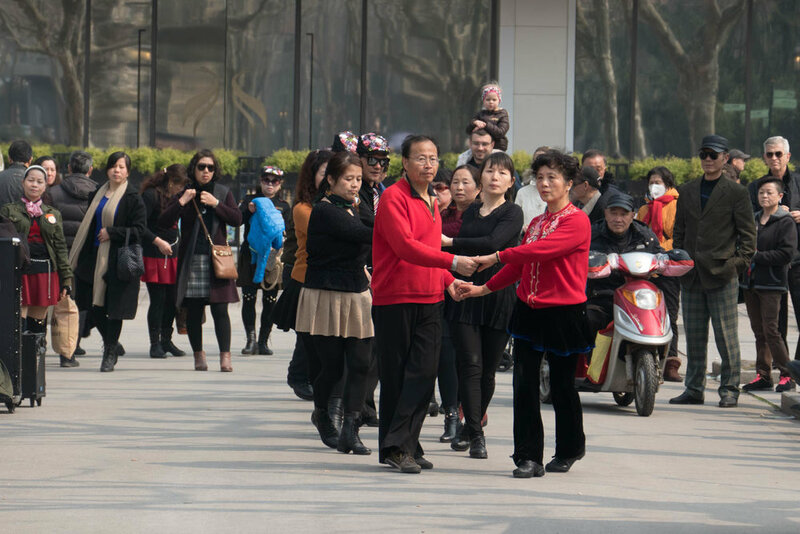 It is common to see groups of mostly older women exercising and dancing in the parks to music, played from a portable sound system. Sometimes there are leaders but oftentimes everyone seems to know the moves well. Sometimes at least some of the dancers are in uniform while others join in without affiliation. In several cases we saw competing groups of dancers with equally loud music. Adding to the cacaphony are smaller groups of music makers: a few people playing jazz (usually saxophone), singers (usually operatic and quite skilled with their own microphone and speakers), or Chinese classical instruments (huqin or flute). All in all it can be quite chaotic but no one seems to mind the competing sounds. The other common sight is groups gathered around to kibitz others (usually men) playing cards or mahjong or Chinese chess. It’s difficult to understand why watching the games is so fascinating but it seems to be a way to fill the time. 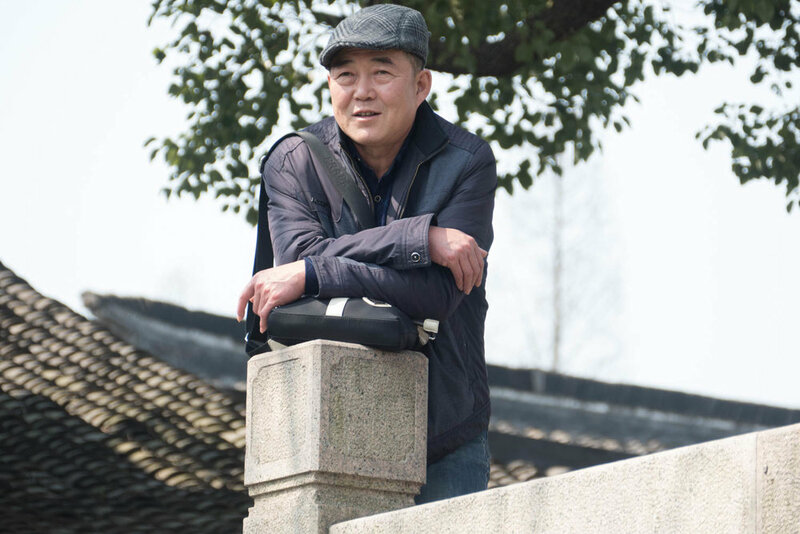 The mandatory retirement age in China is very young: 60 for men and 55 for women so most of the people one sees in the park are likely retired. Much of the child raising is also done by the grandparents. 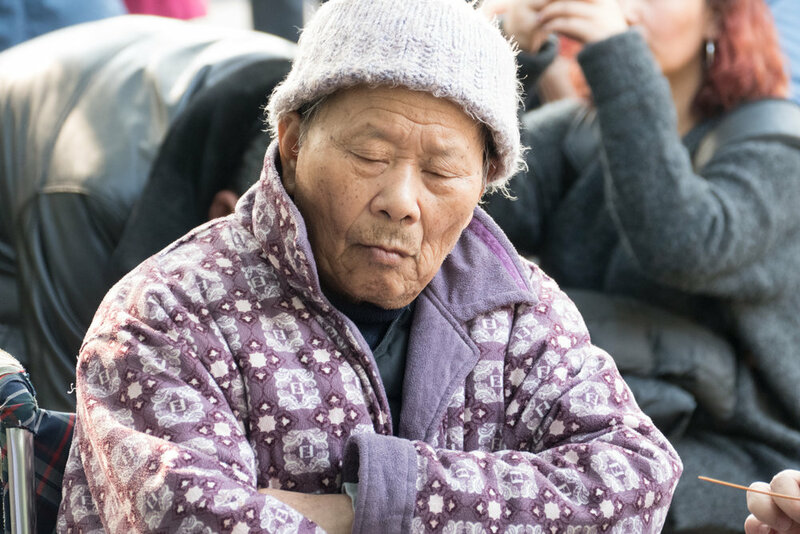 There was a grade school very close to our Airbnb and there were large groups of elderly grandparents gathered in the morning and afternoon to accompany the kids in the morning and afternoon. In the parks on weekends there were many groups with three generations. It’s also common to see older men doing calligraphy on the sidewalk with large pens using water. In fact there are special pens designed just for this activity that hold a reservoir of water so you don’t need to dip the pen into a pail. The characters quickly evaporate but are there long enough for passersby to comment and critique the artistry. At People’s Park there is a curious marriage market where parents and grandparents bring an umbrella and tape a one page description of their eligible son or daughter, or grandson or granddaughter, in hopes of finding a match. Match.com meets the Farmer’s Market in the marriage mart in People’s Park. She was undoubtedly the most revered woman in China. She was the middle of the famous three Soong sisters all of whom married the very highest echelon of Chinese leaders. She married Sun Yat-sen who is widely regarded as the person responsible for breaking up the old Qing dynasty and was the first president of the Republic of China. Her older sister Ai-ling married the rishest man and finance minister of the country H.H. Kung and the younger sister Mei-ling married Chiang Kai-chek, the leader of the Kuomintang Army and later president of the Republic of China. Ching-ling, unlike her sisters, stayed in China to support the Communist regime after they seized power in 1949. A favorite expression about the three sisters is that the older one loved money, the youngest one loved power, and the middle one loved her country. The sisters hailed from Shanghai and her residence is maintained today. Interestingly, they all went to college in the USA at Wesleyan College in Macon, GA. The youngest sister, Mei Ling, transferred and graduated from Wellesley College in Boston. Sun Yat-sen’s wedding gift to his wife, Soong Ching Ling. Probably the first thing one notices when you land in China is that it has a lot of people, especially in the big cities, but also in the rural areas as well. It is difficult to find a place in a city where you are the only person in the neighborhood. One thing that surprised me about traveling around the country is the great variety in faces, reflecting the many ethnic groups that make up being ‘Chinese’. In the US we tend to think that Chinese are all Han but that simply reflects the economics of who has money to immigrate or visit abroad. For example, I was surprised to discover that virtually all of the small noodle restaurants, of which there a many, in Shanghai are operated by Muslims. 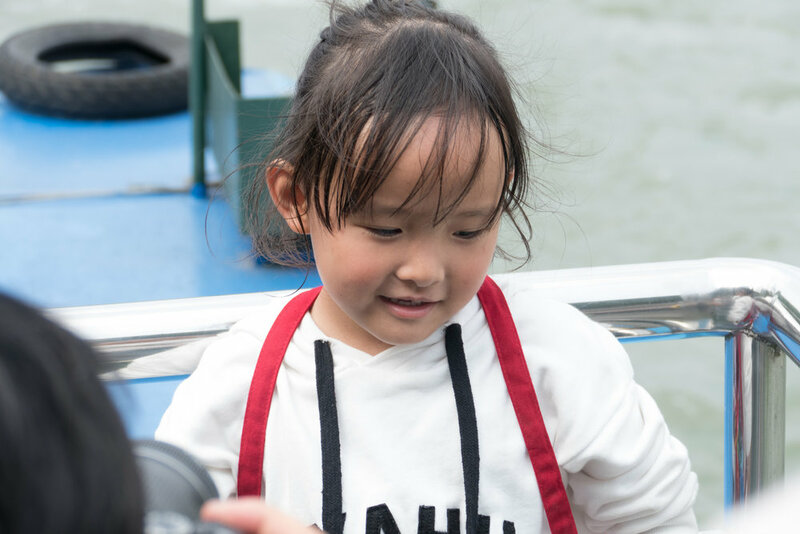 Chinese kids are the cutest!